Data reported from U.S. Wii owners that have used the Nintendo Channel. 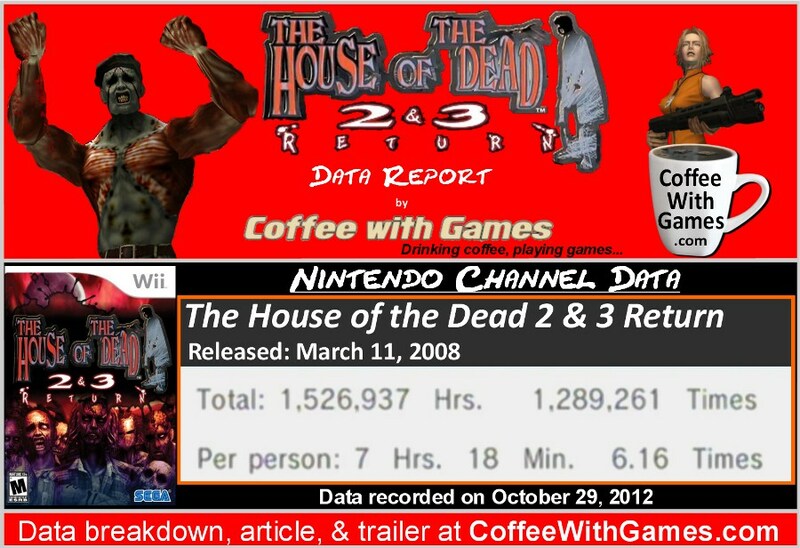 The House of the Dead 2 & 3 Return has approximately 209,295 Wii owners from the U.S. that have reported the 1,526,937 hours of gameplay, with 1,693 days possibly reported. The game's play-time has increased almost an hour from the average reported over 2 years ago, and is now at 7 Hours 18 Minutes "Per person", which averages out to be about 1 Hour 11 Minutes played per time/day. How was the game received by critics and customers? The game has a "professional" review score average of 65.55%, based on 33 reviews on GameRankings.com. It has a customer review score average of 77.92%, based on 125 reviews from Amazon.com. Apparently, like many Wii titles, gamers enjoy the game more than critics. I played The House of the Dead 2 on the Sega Dreamcast, and I dug through my Dreamcast collection earlier tonight trying to see if I had a copy of the game. I thought I had a copy, because a friend gave me the Sega Dreamcast Starfire blaster, but I couldn't find the game in my collection unfortunately. If you haven't seen any footage of how The House of the Dead 2 & 3 Return looks on the Wii and the type of gameplay it offers, the trailer below should give you a good idea of what you can expect. When the game released it was originally $29.99, but you can now find it used for under $20 at Game Stop and Best Buy, or for right around $10 used on Amazon.com, HERE. Seeing it has a play-time average "Per person" of under 10 hours, I think picking it up for less than $10 would be the best route to go if you're interested in the game. If any of you played this on the Wii, would you recommend it to other Wii owners that have been interested in it, but haven't bought it yet? Also, if you played and beat both games in the collection, do you remember how many hours they took you to complete? 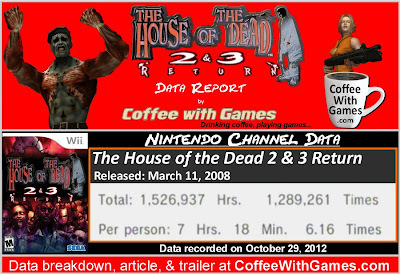 I can certainly recommend House of the Dead II & III, as it is a decent arcade title, with a suitable amount of new life breathed into it with the IR pointer in the Wiimote. The game is frantic, but rewards accuracy with bonus lives and points, extending replayability. It is ever bit the awesome party game that the Dreamcast original was. I picked it up recently for a rather cheap price and would certainly recommend it, it's especially good with two players. Awesome! Thanks for the feedback on it, and accuracy being rewarded I think is awesome, as often times it doesn't matter in games how many times you fire your weapon, just so long as you survive. Thanks again for the comment and feedback! Glad to know it's good with two players, as my wife might be willing to give this type of "shooter" a try. She doesn't generally try/enjoy first-person games, but in this she wouldn't have to worry with the movement since the camera is adjusted on its own. I'm almost a year too late... But I felt it was OK to share a few thoughts though, because this game never really gets old for me, so maybe someone out there might like it as well. Anyway, if you're a fan of the series (or even rail shooters in general) then there's a good chance you'll like The House of the Dead 2 & 3 Return. I particularly enjoy playing THotD2's Original Mode because it adds freshness to each run and improves replay value. Playing it with the Zapper is even more fun. I already owned the original but as the Dreamcast Gun wouldn't work on newer TVs, I decided to give this a go and didn't regret it. Sega could include the original THotD but it's a great package nonetheless. Thanks for the feedback, and I'm glad you found the post! Being that the Wii U is backwards compatible with Wii games, and even has a sensor bar included with the system, I think this could be one of those games to pick up around Halloween this year. 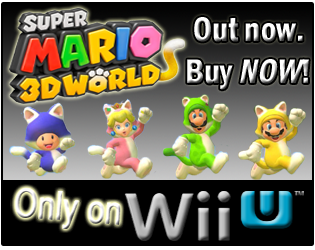 Do you have a Wii U by any chance? Thanks for the reply! 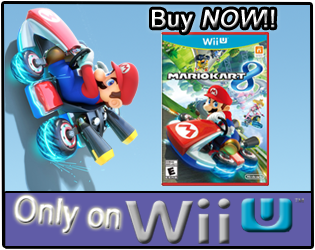 No, unfortunately I don't own a Wii U yet, but I'm eager to buy one and will likely do so by the end of the year. I do own a 3DS, though. Indeed, Wii U's backward compatibility surely helps to keep the game relevant and it's hard not to get it with these prices! And again, thanks for taking the time to reply! We're in opposite boats right now. I have a Wii U, just not a 3DS yet. I probably wouldn't use the 3DS a lot myself, but our oldest child enjoys gaming on a DS Lite, and we're thinking of getting him a 2DS/3DS for Christmas. Thanks for the feedback, and the reply!